Many of us face daily demands and overwhelming difficulties that cause seemingly uncontrollable feelings of anxiety and fear. When you feel this way, it's healing to soothe yourself, reclaim your sense of innate goodness, and gain insight into the cause of your suffering. This book offers meditations, mindfulness practices, self-inquiry exercises, and yoga poses that calm your body, quiet your mind and open your heart. Let this book be your healing companion. Be touched by the inspirational true stories and embrace the yogic practices and soon, you'll be free from the anxiety and fears that hold you back as you reconnect with your inner self, clear your mind and live with a loving heart. "Feeling anxious is so much a part of modern life that we almost forget how limiting it can be. But not these authors. They offer us clear information and techniques for dealing with anxiety on a daily basis. They teach us what the brain does when we are anxious, and what we can do about it, by changing the focus of our thinking and getting us on the yoga mat and meditation cushion for time-honored practices. —But mostly they give us readers the confidence that we can transcend our anxiety and lead richer and more enjoyable lives. Highly recommended for yoga teachers and others interested in the whole picture of anxiety, including the spiritual angst that usually accompanies it. I especially enjoyed the personal stories scattered throughout the book." "Writing in a clear, step-by-step format, Mary and Rick NurrieStearns provide simple practices to help identify and counteract negative thoughts, induce relaxation, develop awareness, reduce stress, and heal anxiety. The authors create a connection with the reader by using images and examples from everyday life that resonate with everyone’s experiences. Yoga for Anxiety integrates modern psychology with basic yoga practices, including postures, breathing, mindfulness, and meditation. In the early chapters, basic information suitable for beginners provides the foundation for more advanced material as the book progresses. For anyone suffering from anxiety, Yoga for Anxiety is a great place to begin the journey to recovery." "Yoga is one of the best-validated therapies in the entire field of integrative medicine. It is especially valuable because it addresses all we are: body, mind, and spirit. 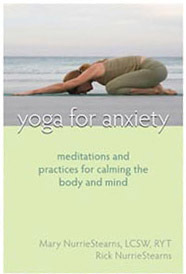 Yoga for Anxiety is an excellent guide for anyone seeking greater serenity, peace, and fulfillment, and who isn’t?" "By combining traditional psychology with the deep teachings of yoga, Mary and Rick NurrieStearns help you move past anxiety in order to experience your true nature. Yoga for Anxiety clearly shows that when you are willing to mindfully face and release your anxiety, it actually becomes a doorway to deep inner freedom and happiness."